Scotland’s Colin Montgomerie picked up his first professional title in six years by winning the Travis Perkins plc Senior Masters at Woburn by six strokes. Montgomerie cruised home around the Duke’s Course with a final round of 70 to pick up his first European Senior Tour title in just his third start on the circuit. It’s his first victory since the 2007 European Open at the K Club. With Montgomerie away and clear, there was a secondary battle to see who would finish as runner-up. 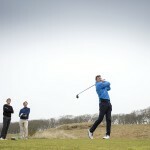 In the end it was Spain’s Miguel Angel Martin, together with Paul Wessenlingh of England who closed with a superb 66. Monty began the final round three clear of Carl Mason but, with a birdie and an eagle in his first five holes, he established a commanding advantage that wouldn’t be threatened for the rest of the round. Montgomerie is the third rookie in a row to win on the European Senior Tour, after Denmark’s Steen Tinning at the Berenberg Masters and Santiago Luna of Spain at the SSE Scottish Senior Open two weeks ago.